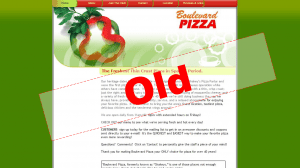 Welcome to the ALL NEW Boulevard Pizza website! We’ve been brimming with anticipation to show you our all new look. Thanks to the awesome team at OCG Creative, we were able to get a site that looked as mouthwatering as the pizza. One of the coolest aspects of our website is it is now ready for the small and big screen. With the help of responsive design our website grows and shrinks, adapting to any screen anywhere. Test it out right now. If you’re on your desktop or laptop, grab the window and resize it to the left or right. You’ll see everything magically figures out how to fit in place. Boulevard Pizza is proud to be the oldest pizza kitchen in Sparks, serving the best thin crust pizza in the area. And now it’s safe to say we have the best pizza website in the area as well. So explore, have fun and don’t drool on your keyboard.